Guest blog post for CEA: Should Non-Technical Startup Founders Learn to Code? If you’re a non-technical founder looking to start a startup, you’re at the mercy of software developers whom you need to build your product. To avoid this problem, should you learn to code? Learning software development is a huge time and mental commitment and your decision basically comes down to one question – is this the best use of your time? Read more. 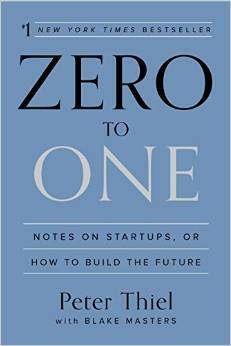 I recently finished reading Peter Thiel’s book, Zero to One: Notes on Startups, or How to Build the Future, and it’s a must-read for anyone working on a startup or any product in general. Peter Thiel was the founder of PayPal, co-founder of Palantir, an early investor in Facebook, and runs Founders Fund, an early-stage venture capital firm. Needless to say, the dude knows his stuff about startups. What valuable business is nobody building? Let’s dig into each of these a bit more. The most contrarian question of all is likely the hardest to answer. The point isn’t to purposely think the opposite of what the crowd thinks; rather, it’s to understand how you can think for yourself and be different than everyone else. I think Pandora is a great example of this. Back in the early-to-mid 2000s, iPods and MP3 players were ubiquitous and Apple was reinventing music with iTunes. Who would have thought then that people wanted to just listen to music streamed to your computer that some algorithm selected? This is the business version of the first question. If you can answer question #1 and build a valuable business out of it, you’re going to be successful. The key word Thiel highlights here is “valuable.” In order to build a valuable business, you need to both provide and capture value. Let’s go back to the Pandora example. While the company certainly created value for its users, whether it could capture any value was in doubt for a long time. High music royalty fees nearly toppled the company, but Pandora was able to strike deals to pay musicians fairly and sell enough advertising to capture value. It’s now a thriving public business, pulling in over $239 million in revenue in the 3rd quarter of 2014. This tenet is directly related to a business’ ability to capture value. Thiel compares the airline and search industries to make his point. Airlines, like United and American, provide a lot of value (they move many people from place to place) but captures very little (they make a paltry margin, if any). Google, on the other hand, creates much less value but captures much more (it’s worth 3x more than all the airlines combined). And the reason for that is that they’ve basically achieved a monopoly in search. For startups, competition sometimes is considered to be a good thing, as it sort of validates your concept and shows that the customer demand for your product is high enough for other companies to want to build it. Apparently, Thiel is thinking contrarily again. If you found this recap interesting, you’ll certainly want to pick up the book and read it entirely. For anyone interested in products, startups, or just a different way of looking at things, it’s an easy and interesting read. I love days that are full of both teaching and learning, and Wednesday was one of those days. Here’s how my day went and what went down. On Wednesday morning, I helped run a Startup Weekend pitch bootcamp for the Inter-American Development Bank (IDB). The IDB is preparing for their own corporate Startup Weekend in a couple of weeks to spark innovation throughout the company, so we held this bootcamp to help employees understand how to convey the key elements of their idea in a one-minute elevator pitch. They only had seven minutes to develop all of the above, and then only one minute to clearly pitch the idea to the crowd. Feedback was provided for each pitch, and the teams repeated the process twice more to hone their skills. Creating a one-minute elevator pitch is not an easy thing for anyone to learn, let alone a group of employees who are trained to deeply think through solutions and provide in-depth research and statistics about why their project may be a good one. But the IDB staff did an amazing job of getting out of their comfort zone during the exercise and were really receptive to the feedback given. I can’t wait to see how they apply what they learned at bootcamp to the full Startup Weekend! 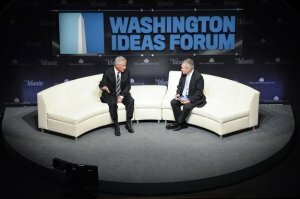 The Atlantic held the Washington Ideas Forum here in DC this week. While I was only able to attend the latter half of Wednesday’s programming, the amount of amazing speakers they crammed into a short amount of time was astounding, and I learned a ton in just a few hours. He’s doing some ridiculous stuff in biology and genomics, including producing bacteria that can make medicine and create clean fuels. What what what? The energy magnate believes that natural gas will separate us from our reliance on OPEC, which is a great thing for this country. Mike believes that we’re just getting started with the curated web and that Flipboard will be the leader in delivering the best curated content. Anant and Jim were interviewed together and highlighted how education is undergoing transformative change. Anant highlighted how online education is disrupting higher ed, and Jim focused on giving students specific skills, like computer science, that lead directly to jobs. David highlighted how the Smithsonian is all about giving people access to its high-quality programming, both physically in Washington DC and digitally through the web and apps. That will continue when he takes over. Dean believes that kids think science and technology isn’t fun, so he created First to combine the competition and entertainment aspects of sports with the subject matter of engineering and science to get more kids interested. Dean also created a fully controllable and life-like prosthetic in just two years. He’s working on other amazing energy and clean water projects. The guy is just an inventor through and through. This is the second time I’ve seen him speak and it’s more and more evident that he hates incremental change and wants people to work on big ideas, like underwater cities. Also, he very much questions higher education and compares exclusive universities to nightclubs – they’re expensive to attend, are all about status, and there’s long line of people who want to get in – and these schools want it this way. Both Steves were interviewed by the great Walter Isaacson. Steve Crocker basically invented the Internet and told the really interesting story about how it came together. We owe a lot to that guy. 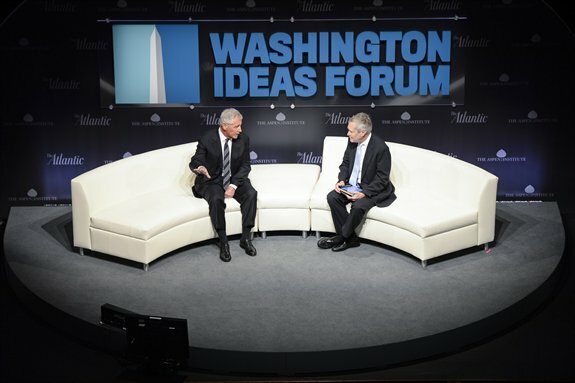 Steve Case talked about the third wave of the Internet will be incorporating the web into all aspects of our lives – transportation, healthcare and the Internet of Things at home. He also highlighted his “Rise of the Rest” initiative that aims to facilitate entrepreneurship anywhere in the country, not just Silicon Valley, NYC, and Boston. Wednesday was a jam-packed day for me. But it felt great knowing that I helped the employees at IDB think differently and that I learned from many others who think differently as well. In December 2013, I wrote a guest blog post titled “10 Essential Tools and Resources for Entrepreneurs to Get Stuff Done,” which highlighted 10 important resources that I use to help me stay productive. It’s been a few months since I wrote that article, and I’ve changed and added some tools and tricks to the mix. Here are some additional resources that might help you be more productive like they’ve helped me. Startup founders’ trials and tribulations have been written about frequently in tech and business publications and mostly focus on how brutal it is to run a company. But I believe there are many entrepreneurs like me who are in the earlier stages of building companies, where things are moving more slowly than we’d like, and just aren’t far along enough to relate. Lack of progress can be very taxing on an entrepreneur’s psyche and confidence, and it certainly has taken a toll on mine. I’ve worked on dealing with these thoughts over the last two years and here’s what I learned about managing my mind. A quick and relatively cheap way to validate our startup idea, Locatize, was to run online ads targeting potential users, lead them to a landing page, and see if they give us their email address to stay updated on Locatize’s progress. Here’s what we did to test the demand for Locatize and how you can test your startup idea, too. Happy Father’s Day, Dad. Your entrepreneurial spirit lives on. Happy Father’s Day to my Dad and all the Dads out there! On this Father’s Day, the influence that my Dad has on my family is as evident as ever. My Dad was an entrepreneur, having owned and operated several Chinese restaurants in New York City. When my sister and I were young, my father always told us that working for ourselves was the best path to both financial success and happiness (or satisfaction), and he instilled in us a mentality of curiosity and continuous learning. This obviously had an effect on me and my sister. I’ve run my own businesses for almost two years now. And recently, my sister Julia jumped into the world of entrepreneurship by leaving her full-time job to focus on JSC Fitness and other endeavors. My father would be really proud right now. I think he would be equally proud of the fact that we’ve been able to surround ourselves with amazing family to support us everyday. My Mom was the bedrock for my Dad, working stable jobs in bookkeeping and accounting to bring in steady income that allowed my father to take on the risk of opening restaurants. My wife Vicky is the same; not only does she have the steady job, but she has to deal with my anxiety and uncertainty on a daily basis. And I know my brother-in-law Manuel is playing a very similar role for my sister. And of course, we all support each other. Dad, I know you’re looking down on us with a smile on your face. And we hope we’re making you proud. 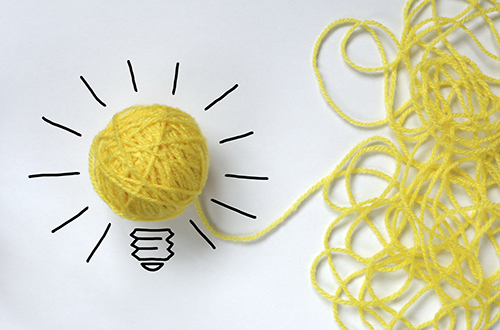 Check out my latest guest post for the Consumer Electronics Association (CEA) titled, “How to Think of a Startup Idea (with co-founders)“. Coming up with a business or product idea is the easy part of launching a startup, but it’s an important one. This is especially true when you’re doing so with an existing team. This post highlights the process my co-founder and I used to agree on a startup idea that aligned with each of our interests, strengths and experiences. I recently read two excellent books – Kitchen Confidential by chef and TV star Anthony Bourdain and The Hard Thing About Hard Things by entrepreneur and uber venture capitalist Ben Horowitz – and took away some interesting lessons from both. While the books seemingly are unrelated – one is about the restaurant industry and the other about running a technology startup – I drew many parallels between the two and both gave me very similar insight. Here’s what I learned. The overarching aspects of running a kitchen and a startup are very much alike. You need to build a great team (more on this later), set your expectations, give your employees everything they need to succeed and let them do their thing. In the kitchen, after putting together his team, Bourdain provided them with direction about the menu, guidance on how he likes things done, and the ingredients they need to create delicious food. In his startup, Horowitz was responsible for raising money to keep the company going, setting expectations for all of the staff, and creating processes and a culture to allow everyone to flourish. While the inputs may be different, the fundamental activities of an Executive Chef and startup CEO are similar. The Food Network and shows like Top Chef glorify the culinary world and make us think that cooking gourmet meals and running a restaurant are easily achievable. In the same vein, tech publications like TechCrunch and PandoDaily, who constantly report on startups who are “crushing it”, make it seem like running a startup is a piece of cake. Quite the contrary. Both are complete grinds that wear you down physically and mentally. In the kitchen, your day may entail peeling 300 potatoes; no one will show that on TV. In a startup, you’re responsible for making cold calls, dealing with product bugs and issues, hearing customers complain, balancing the books, and many more menial, thankless tasks that are necessary to keep the lights on. Even when you leave the office, your mind never stops thinking about your company. Both are grueling jobs that require passion and determination to succeed. If you’re in it only for the glory, you might want to pick another career. These books make that very evident. The most important task of executive chefs and startup CEOs is to put together the best team possible. Bourdain stresses the importance of hiring the right people for his kitchen’s situation, which is typically an intense, raucous, profanity-laden environment where his employees are physically and mentally pushed to the edge. High falutin, entitled CIA graduates have been eaten alive in his kitchen; he prefers hard-working, tough-as-nails cooks manning his stations (ironically, Bourdain graduated from the CIA). Bourdain’s kitchens are well-oiled machines, and he completely depends on his employees, from the sous chef all the way down to his dishwashers, to achieve this. Thus, hiring the right candidates who will do anything to get the job done and who fit his kitchen’s culture is of utmost importance. Same deal for startups. Horowitz’s company, Opsware (formerly LoudCloud), was similar to Bourdain’s kitchen – hard-charging and full of cursing. Thus, he had to hire the people who fit into this culture. But the difference between a startup and a restaurant is how much the former changes over time; therefore, it’s important for the hiring process to adapt. In a startup, products and business models can change very quickly, and the right employees for today may not be the best employees for tomorrow. Regardless, you need to hire and maintain the best team possible. Another great point that Horowitz explicitly made (and Bourdain made more implicitly) was to hire for the candidate’s strengths, not for lack of weaknesses. To portray this, Horowitz walked through his process for hiring a head of sales for Opsware. The candidate, named Mark Cranney, was awkward, introverted and generally not an affable guy, but he could sell snow to an Eskimo and train a team to do so. Everyone who interviewed him didn’t like him but Ben hired Mark anyway. He became a star and was critical to the growing the company to eventually sell to HP for $1.6 billion. As Horowitz titled one of the chapters in his books, take care of the people, product, and profits – in that order. The most important task is to hire the best for your company’s – or kitchen’s – situation, and take care of those people and help them succeed. I highly recommend reading both of these books even if you don’t work in these industries, as they are both educational and entertaining. You won’t regret it. If you’ve read these books, what did you think? I’d love to hear your thoughts in the Comments section.